So you think you have a brown thumb, not a green thumb? Or, you waited too late to buy bulbs for indoor forcing. Not to worry. 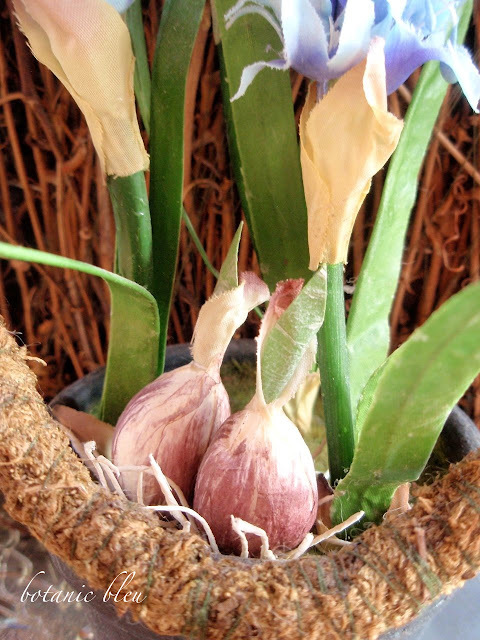 You can still have flowering bulbs in the middle of winter. And these do not need watering. Yes, I'm talking about artificial flowering bulbs...faux bulbs. You may be shaking your head, "I don't like artificial flowers," but before you rule them out, take a look at this collection of artificial flowering bulbs. Admittedly, some of the varieties look more realistic than the others. 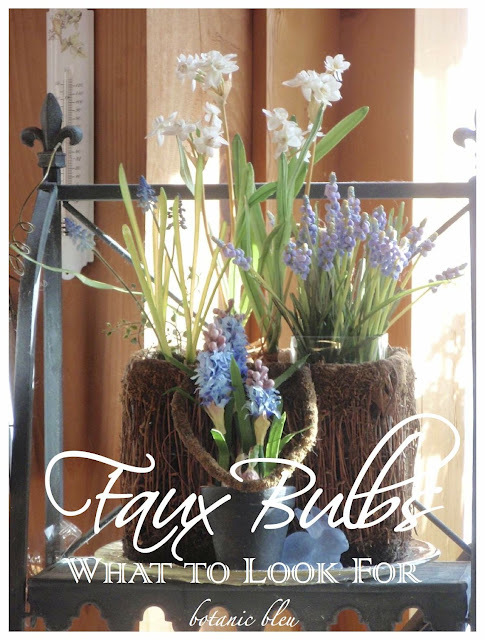 What do you look for when buying faux bulbs? One of the first things to consider is what materials were used to make the plants. The ones that I think look the most realistic are the ones made using fabric instead of plastic. Look at the paperwhite blossoms that are made from fabric. One of the best features of the blossoms is the beige wispy papery thin skin at the base of the flower cluster. One of the least desirable features of this faux paperwhite is the leaf with its clearly visible wire. The wire is a mixed feature. Being visible detracts from the plant, but being present allows repositioning the leaves into more realistic positions. Mixing the four artificial groups of plants together mimics mixing bulbs grown outdoors. 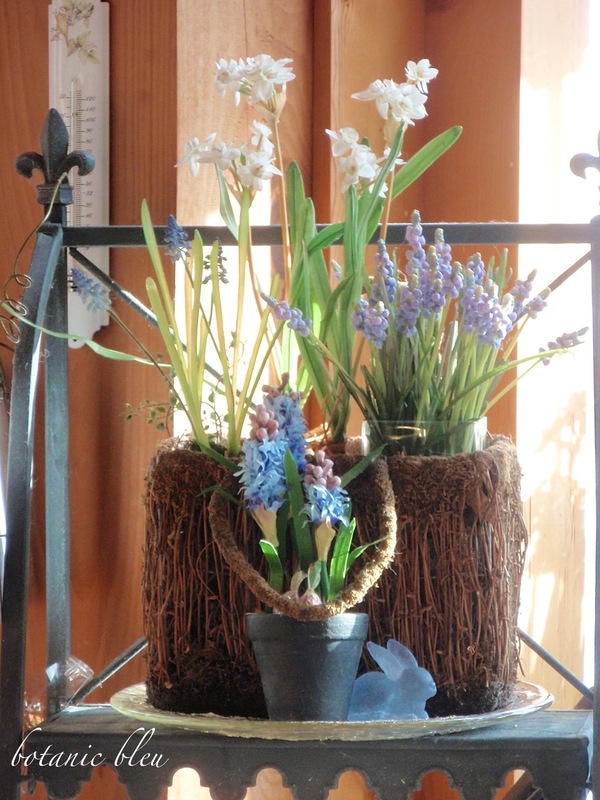 There are three hyacinth plants in this arrangement. Each of which has its own realistic features. 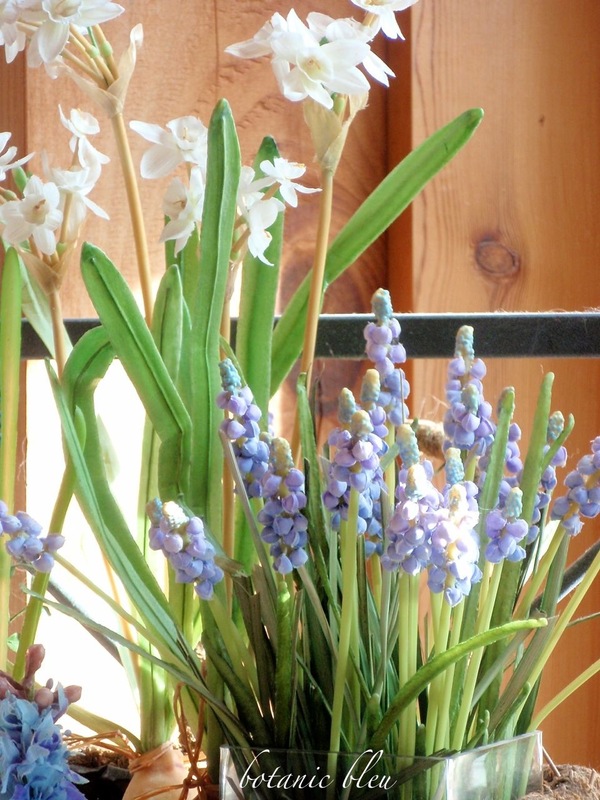 The potted hyacinths are the least realistic ones in the group, but still have some redeeming qualities. The blooms are made from a combination of plastic and fabric that simulate the open flower buds and the closed buds at the top of the flower. 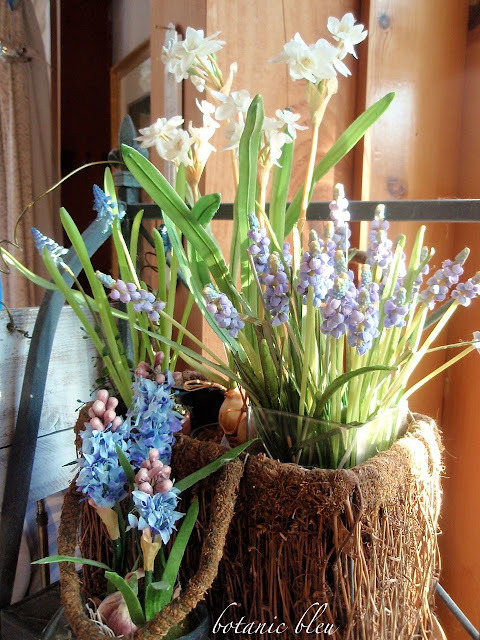 The unsprouted bulbs are some of the best features of the faux hyacinth. These leaf stems are more life-like than the paperwhite leaves, but cannot be repositioned like the paperwhites. That is just one of the several reasons why this plant looks real. 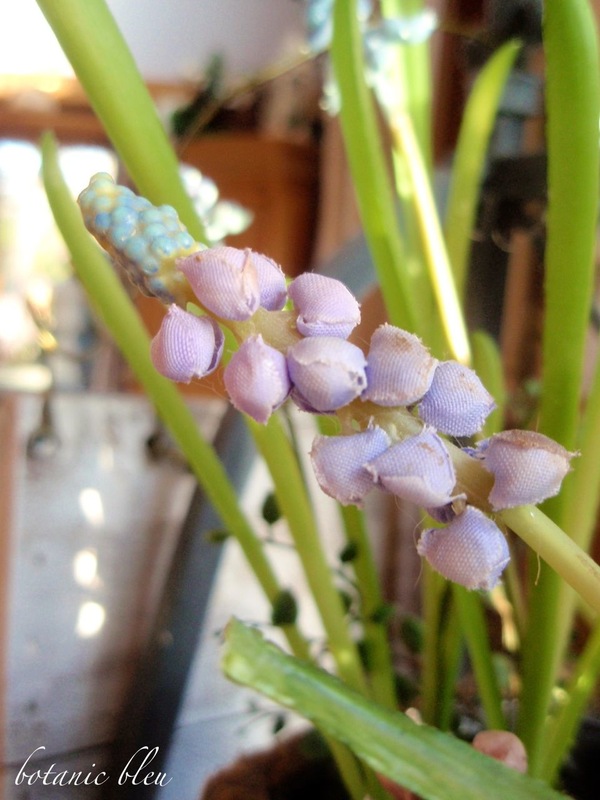 The sparseness of the bloom stalks reminds me of the real grape hyacinths that grow in my yard. The real plants have many leaves with just a few bloom stalks. Next, the small-leaved plant with its round leaves in the same pot adds to the naturalness of the plants. In the yard there are always other little volunteer plants growing alongside planted ones. 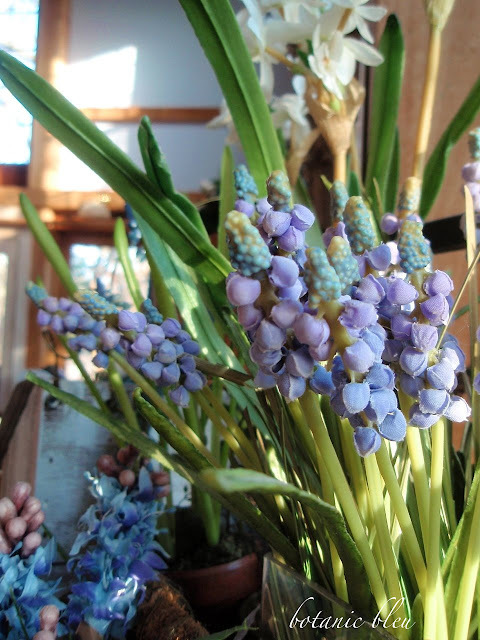 Even though the bloom is made from plastic, it looks pretty realistic due to the variations in color and individual bud sizes, both of which are the ways real grape hyacinths grow. 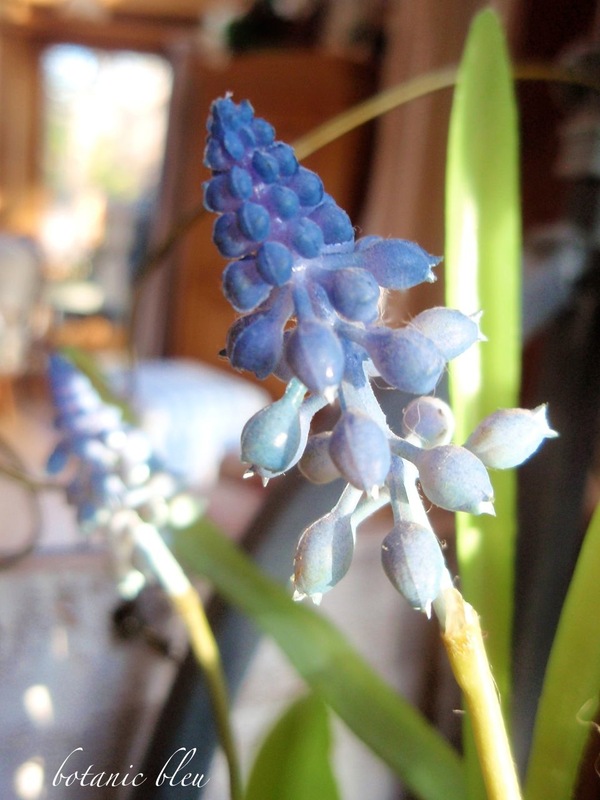 The third group of hyacinth blossoms are a mixture of fabric and plastic. Plastic blooms just do not seem as authentic as fabric ones and also tend to break down over time. Sometimes the plastic plants become brittle, other times they become greasy, almost melted. These grape hyacinths were on the more expensive side, and have retained their color, shape, and texture. 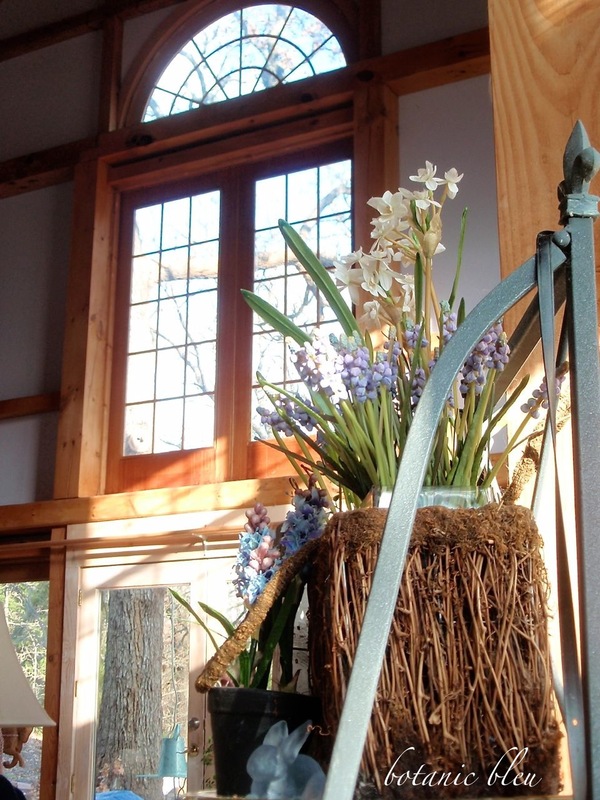 Design of a faux bloom makes a difference in how good it looks. A closer view of the second artificial grape hyacinth shows the difference in the design in this hyacinth compared to the other grape hyacinth which is more realistically designed. This bloom has uniform fabric buds with an abrupt change to the smaller plastic buds at the top... not a very life-like design. Seeing the plants from different angles is important. All of these plants have overall profiles that look like their real counterparts. The gentle draping leaf stems and blossom stems look real compared to some other artificial plants that have stiff upright stems. 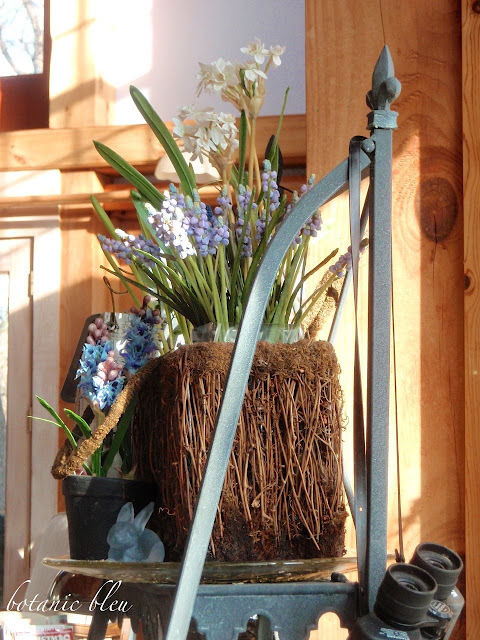 Using natural fibers like the vine basket holder helps the faux flowers look more natural, also. Varying the heights of the plants to keep the same scale of different heights as real plants is another factor in making faux plants look real. 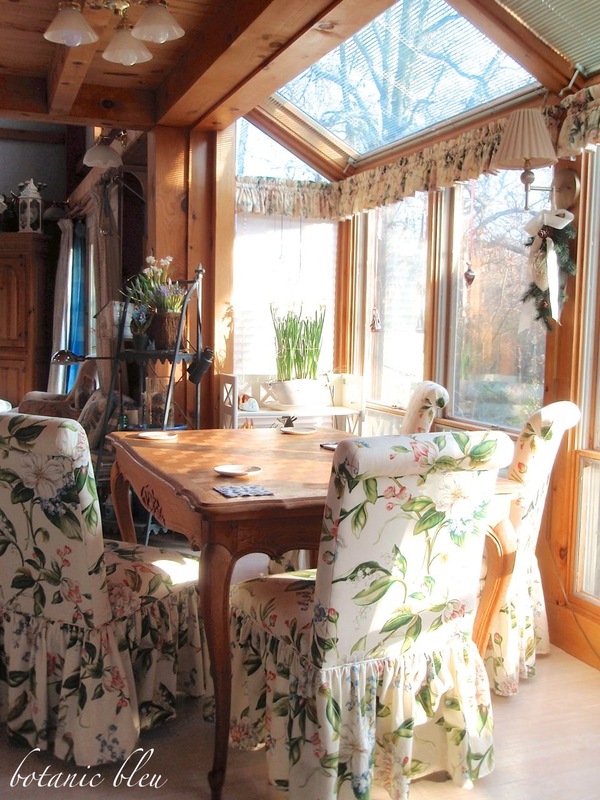 From across the room, the plants look very much like live plants. The paperwhites on the white book shelf are real. 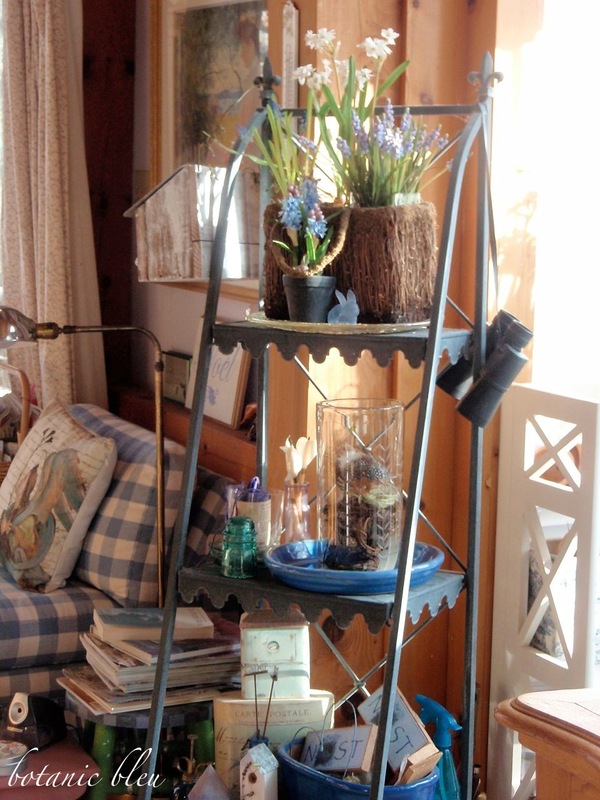 A couple of readers asked how I get real paperwhites to stand up without falling over. The answer is mixed. I tie something around the cluster of paperwhites to help them stay upright. Then in the end they still topple over. 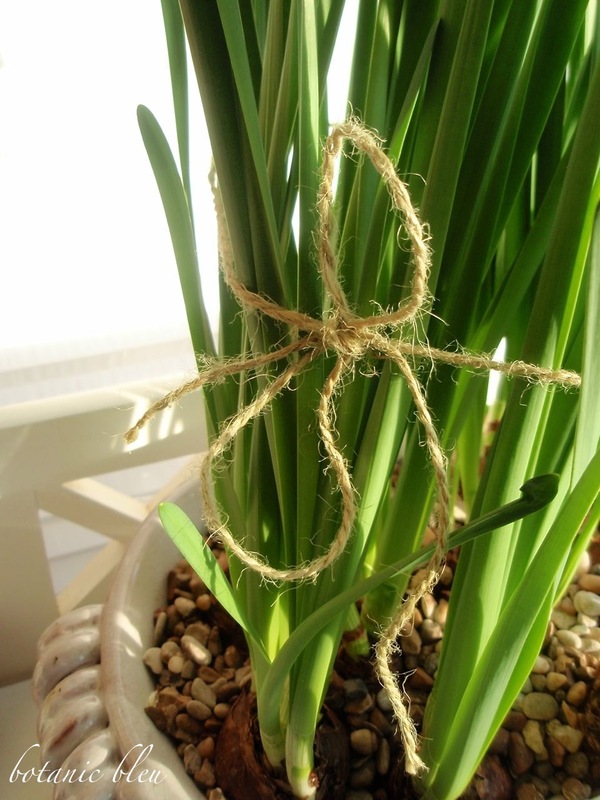 This year I used green twine which goes very well with the green stems. In past years I have also used ribbons, varying from grosgrain to satin to Christmas, just whatever was pretty. Starting the week of January 11, we'll (Google) remove the ability for people with Twitter, Yahoo, Orkut, or other Openid providers to sign in to Google Friend Connect and follow blogs. At the same time, we'll remove non-Google Account profiles so you may see a decrease in your blog follower count. To make sure you never miss a Botanic Bleu post, sign up to get Botanic Bleu delivered right to your email address or follow by Bloglovin'. Just type your email address in the box beneath FOLLOW BY EMAIL found in the right side-bar. 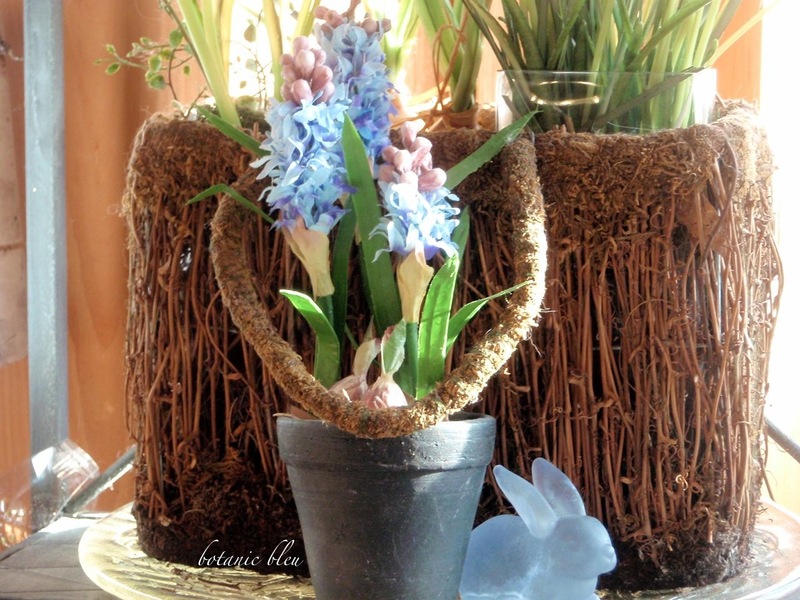 Or... click on FOLLOW BOTANIC BLEU ON BLOGLOVIN' also found in the right side-bar. Helpful post - thank you. Your faux flowers look really nice! I usually don't buy that many because they always look so bad. Yours look really good though- had me fooled! I love to peruse the faux bloom aisle. Every year the flowers get better and better. Great tips. They look real!!! 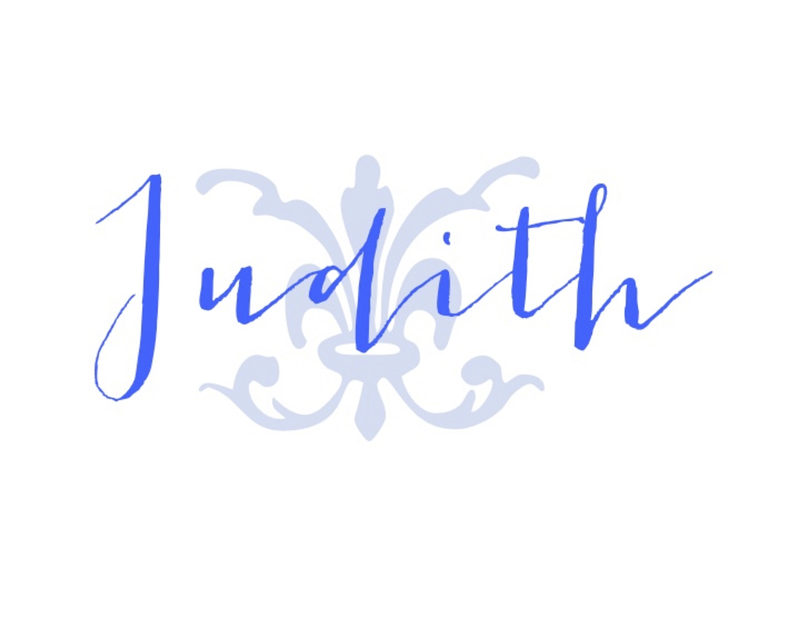 Have a lovely one, Judith! I have several real looking faux. I actually prefer faux paperwhites because I don't really like how they smell. You reminded me that I do have some faux grape hyacinths around here somewhere. I'll have to dig them out. 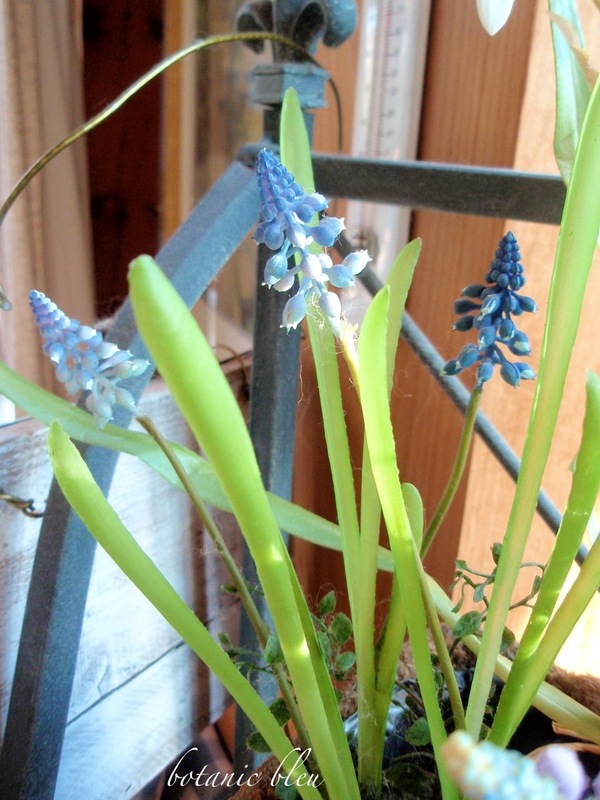 Your grape hyacinths really do look real. Great post. Your blooms are great looking! I prefer real of course, but faux is great for photos and for shop keepers. Yours all look real nice. And thanks so much for the Google announcement! We new something was up!!! They do look real! Wish I had some. I have a couple of faux that I really enjoy. 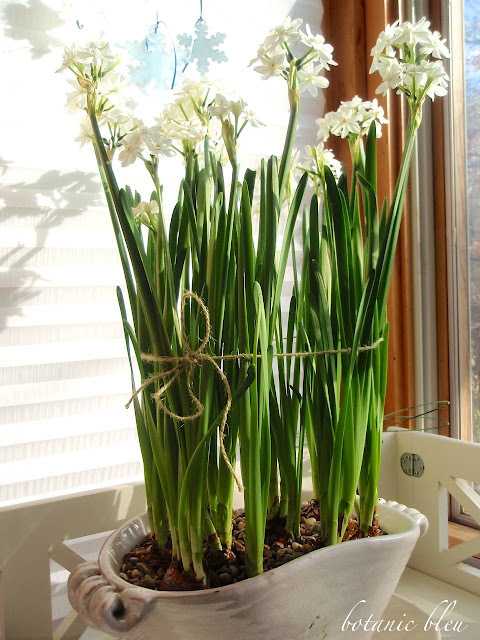 Your previous post actually inspired me to grow the real paperwhites on my kitchen table. I saw a little bag of bulbs at Walmart (already starting to sprout), brought them home and put them in a vase with rocks and water. The best $2.50 project I've done in a while!